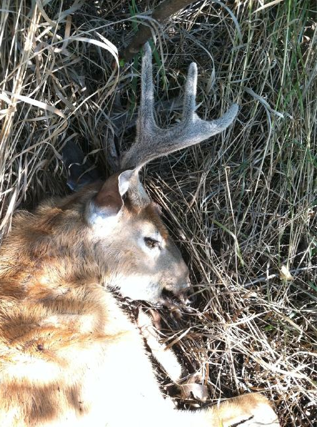 This entry was posted on Tuesday, September 13th, 2011 at 10:16 pm	and tagged with Blue Tongue, deer, EHD, epizootic hemorrhagic disease, Michael Waddell, Montana, Whitetails and posted in 2011, General Tales. You can follow any responses to this entry through the RSS 2.0 feed. I saw Waddell’s tweets too. It was horrifying. We had an EDH outbreak in Pennsylvania in some areas a few years ago. The herd seemed to make a quick comeback, but it was very scary. I too have thought about heading to the Milk River area to hunt, and I imagine the impact on outfitters in that area is going to be significant over the next few years. Blue tongue or EHD is not a contagious disease. The only transmission is through the midge’s(gnats). Itbis not past deer to deer only through the infected bite of a carrying gnat. Can a kid get sick from drinking the water in the river where these deer are dead? Nobody should ever drink river water without proper filtering/sterilization first, regardless of where that river is. While I don’t want to get into an argument over the politics of climate change, this is something that should motivate hunters to stop and think about the potentially devastating effects from shorter and/or warmer winters. The threat of Vector-borne pathogens to both humans and animals is going to increase as temperatures do.